God Eater Resurrection may have come out fairly recently, but don’t mistake it for being a new game. After all, it’s basically a remake of a 2011 PSP game, Gods Eater Burst. What’s more, it’s a remake of a PSP game that didn’t exactly blow people away the first time around, that most people remember — to the extent they remember it at all — as a Monster Hunter clone. Honestly, that’s still a pretty fair assessment. The broad strokes here haven’t changed all that much. Anyone who’s played Monster Hunter — or Toukiden, or Freedom Wars, or Soul Sacrifice, or Ragnarok Odyssey, or any of the myriad other imitators that have come out over the last several years — will know what to expect here. You have a team of fighters/archetypes, and you need to rescue your village/city/world from the brink of destruction by defeating all kinds of monsters. There are minor differences here and there, but really, if you’ve even played one monster hunting game, you’ll know what’s in store here. Just because it’s been done before, however, doesn’t mean that God Eater Resurrection doesn’t do anything worthwhile. For one thing, it looks a lot better than many of its ilk. You might not expect a remade PSP game to look all that great on the Vita, but it holds up pretty well. In contrast to some of those titles I mentioned in the last paragraph, GRE’s world never fades into muddy brown colours. I’m not saying that it’ll dazzle you with the most amazing graphics you’ve ever seen or anything, but you won’t offend your eyes, either. Likewise, the gameplay is pretty solid. Yes, the ultimate goal is exactly the same as what you’ll find in Monster Sacrifice Wars — go to area X, kill everything in sight, gather items, repeat — but it’s clear that GRE was designed with gaming on the go in mind. Many of the levels can be beaten in under five minutes, and on the rare occasion you can’t, the goals are still simple enough that you’re not likely to be at risk of putting the game aside, coming back, and forgetting what it was you were doing. You hack, you slash, you shoot your oversized gun, and then you return back to the hub world and pick up your next mission. It’s enjoyable simple. I should here acknowledge that God Eater Resurrection does, in fact, have a story. I couldn’t tell you what it is, beyond a bunch of students fighting to save the world for their own disparate reasons, but apparently the game’s lore is deep enough that it could inspire an anime of the same name. If you don’t feel like paying attention, though, you don’t have to worry about missing too much. 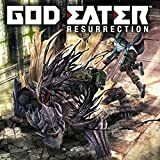 I realize that I’ve probably done a horrible job of selling God Eater Resurrection. My review, basically, is “it’s a MonHun clone that doesn’t look too shabby”. But I want to emphasize that I did enjoy it — a lot more than Monster Hunter, or Soul Sacrifice, or Freedom Wars. (Not Toukiden, though; those games are still my favourite of the genre.) It won’t wow you with innovation, but it’ll sate your monster-hunting urges, and it should, hopefully, get you a little psyched for the sequel, God Eater 2, coming out in North America later this summer. Don’t expect too much, and you should be pleasantly surprised.